The climbing crags around the small village of Osp was our second stop after Frankenjura on our cycling and climbing trip through Europe. While cycling into Osp, we could already see the massive walls on the left side of the village. It is especially famous, for a huge cave at the bottom of the wall, which includes extremely steep routes. 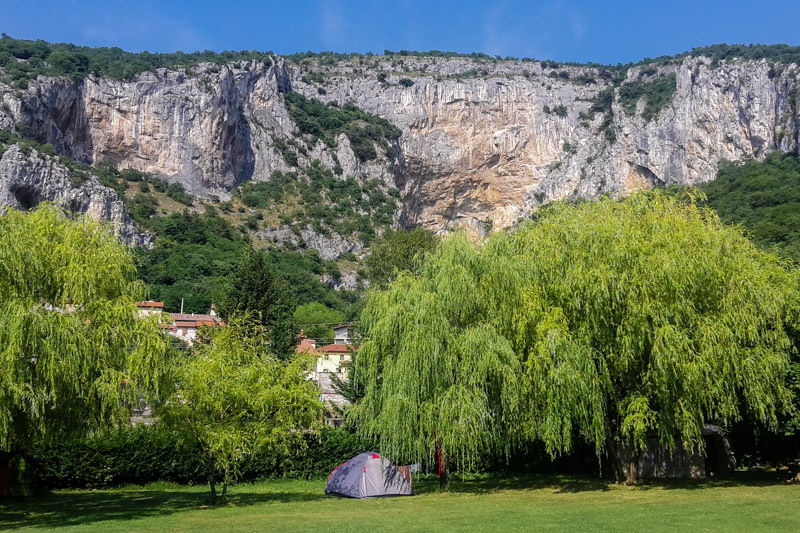 Within the village, there is a small campsite and all the crags can be reached by foot. This makes Osp a perfect spot for cycling, climbing and camping at the same time. Check out our blog post about Osp. The wall just above the village of Osp: perfect for cycling, climbing at camping as everything is close together. There are two main sectors in Osp: the massive wall above the actual village, including the cave, and ‘Misja Pec‘, which is a few hundred meters further on the right. The name of the game in Osp are steep routes, which need a lot of power. 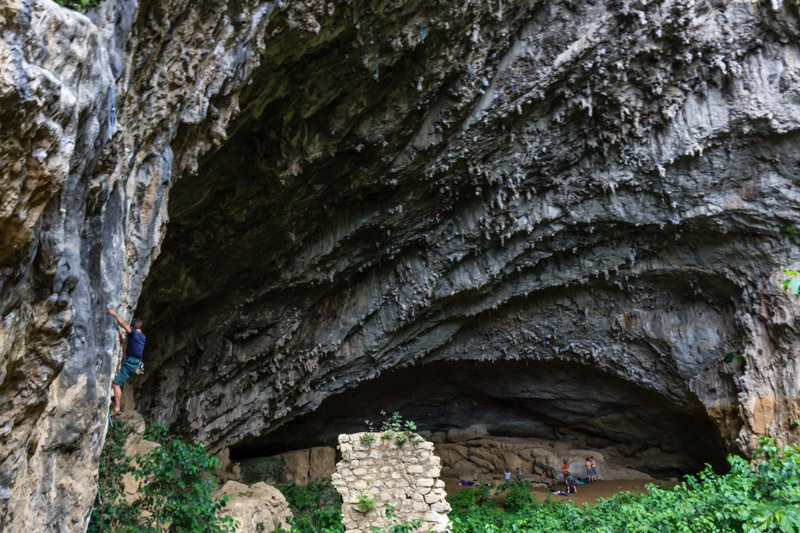 There is a second climbing area close by called ‘Crni Kal’, which has lots of vertical routes. They do not require as much power, but good technique. 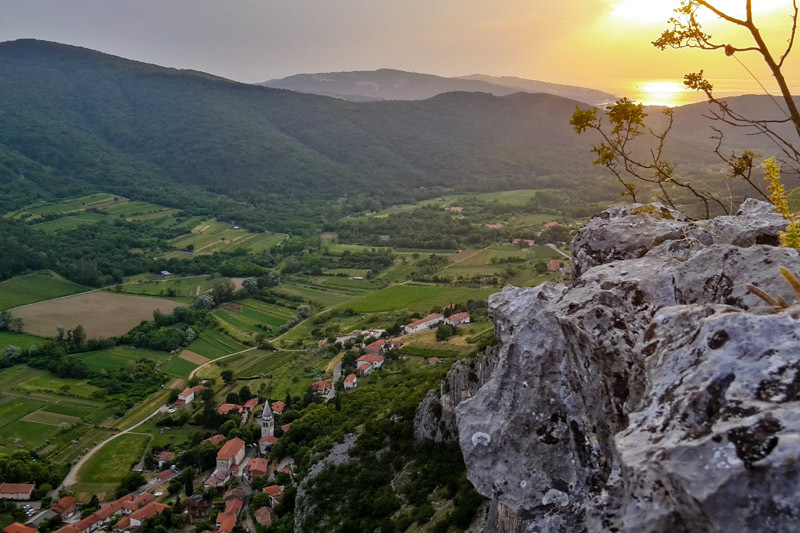 Crni Kal is easily reachable by car, as it is only 5km away. However, this is hard to reach by bicycle as it is also about 300m uphill. As we could not get there by bike, we will not include Crni Kal in this review. Rock and routes The rock quality is mostly very good. We found a few loose rocks just left of the large cave, but these were exceptions. Steep tufa routes dominate the climbing style, especially within the large cave. The climbing crags around Osp are situated in a quiet valley with beautiful views. From the top of the wall it is even possible to see the Mediterranean Sea. All crags are easily reachable by foot within a few minutes and the base of the wall is usually comfortable. Guide book and information: Guidebook Kraški Rob / Karst Edge by Jurij Ravnik. Probably the best climbing guide book ever! The topos are clear, easy to navigate and the layout is great. This makes it already a good book, but on top of that, there are tons of stories or funny cartoons. Reading this book in the evenings is pure enjoyment and fun. The majority of routes in Osp and Misja Pec are above the 7th French grade, so this is not a beginner crag. Easier routes can be found in the neighbouring crag ‘Crni Kal’. As most walls are south facing, the main season is fall, winter and spring. It gets too hot in summer to climb and there is not a lot of shade. We were there in June, which is low season. It was very hot during the day, but we could always find a shady route in Misja Pec. However, it was not possible to climb in some other sectors, as they are in the sun most of the day. The beauty of the low season is that we had the camp site and crag most of the time to our self and it was very quiet. On rainy days, it is still possible to climb in the large cave. We had many favourite routes in Osp, but some outstanding routes are ‘Kindergarten’, ‘Hrenovka’, ‘Jonathan Livingstone’ or ‘Runo’. The multi pitch ‘Medo’ was also very enjoyable and we loved the view from the top. Accommodation: There is only one small campsite (Camp Vovk) in Osp, which is pretty basic, but good. It is a small grassy area with a simple bathroom. Price was 10€ per person per night. Access to food: Within Osp there is no shop. The campsite does sell food and seems to be very popular, but we did not test it. Towards Triest, there is a large supermarket about 5km away from Osp, which sells everything. Possible to reach by bicycle, but it takes some effort, especially after a long day climbing. Access to water: No problem. Clean running water at the campsite. Access by bike: Coming from Triest in Italy, it is no problem to reach Osp. The road is well paved and not very steep. However, we had a hard time leaving Osp towards Croatia as it is a steep climb towards the border.